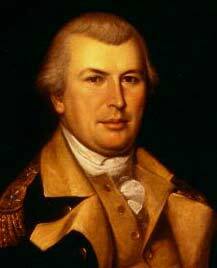 Nathanael Greene was born on 27 July 1742 (Old Style) in Potowomut, Rhode Island. The Gregorian Calendar, which is used today, was not adopted in England or her colonies until 1752. Prior to that year, March was considered the first month of the year in civil matters as opposed to January. According to his father's journal, Nathanael was born on the twenty-seventh day of the fifth month of the year. This makes his birthday July 27th (Old Style) or May 27th (New Style). He was named for his father, who was a respected minister of the Society of Friends (Quakers) and a prosperous businessman. Greene’s mother was Mary Motte, the second wife of his father. Because of Quaker beliefs about education, Greene was only taught reading, writing, and business math. Later, he would comment on this early aspect of his life, "I lament the want of a liberal Education." But, he studied vigorously on his own. He made miniature anchors and other toys to sell in Newport so that he could buy books. Furthermore, he would receive guidance in his self-education from two influential men. The first man was Lindley Murray, a young lawyer working for John Jay’s law firm in New York. Murray would go on to become the country’s foremost grammarian. The second man was Ezra Stiles, the future president of Yale. As relations between England and thirteen of her colonies in North America deteriorated, Greene was caught up in the general fervor of resistance in New England. After attending a military parade in Connecticut, he became an avid reader of military works. The unlawful seizure of one of the Greene family’s sloops by the H.M.S. Gaspée, a British revenue schooner, made matters personal. On 20 July 1774, Greene married Catharine Littlefield of Block Island. Caty, as she was known by her friends, was attractive and vivacious and would give him six children. She was the niece of two future governors of Rhode Island and the daughter of the deputy to the General Assembly. During the war, she visited her husband as much as she could and was very popular with his associates. In August of 1774, the men of East Greenwich county formed a militia company, which they later incorporated under the name Kentish Guards. Although Greene was a founding member, his participation in the group was challenged because of a slight limp that he had since childhood. The incident hurt him deeply and was only settled when an influential member of the Guards and close friend, James Mitchell Varnum, threatened to resign if Greene was forced to leave. In April of 1775, the Assembly of Rhode Island met at Providence and established an Army of Observation. Two months later, Greene was given command as a brigadier general of state troops. There has been much speculation as to why a man who had never held a military commission was given the command. Less than a year earlier, this same man's position in a militia company had been challenged. He led his troops to Boston, where he showed a talent for assembling supplies and suppressing intercolonial jealousies. On 22 June 1775, he was commissioned as the youngest brigadier general in the Continental Army. A month later, he took command of Prospect Hill during the Siege of Boston. But, he missed the Battle of Bunker Hill on 17 June 1775 while petitioning for more supplies in Rhode Island. In a letter describing the battle, he exclaimed, "I wish we could sell them another hill at the same price we did Bunkers Hill." It was in Boston that Greene first met George Washington. Even during their initial meeting, Washington was greatly impressed. Within a year, he would consider Greene the best of his generals suited to succeed him in case of his death or capture. The feeling of admiration and respect was mutual as Greene named his first born in honor of the commander-in-chief. After the British evacuated Boston, Greene took command of the city. When the Continental Army moved to defend New York in early April of 1776, Greene took command of Long Island. Here, he was placed in charge of the Brooklyn defenses where the British Army was expected to attack. In August, he was promoted to the rank of major general, but was bed laden with a fever during the Battle of Long Island, on 27 August 1776. As a result, he did not see his first action until the Battle of Harlem Heights on 16 September 1776. After the battle, he was placed in charge of the American forces guarding the shores of New Jersey at Fort Lee. This would lead to his most costly mistake of the entire war. Hoping for another Bunker Hill, Greene urged his commander to hold nearby Fort Washington, a strategic bastion for the Continental Army on Manhattan Island. Severely outnumbered and outgunned, the garrison of three thousand men fell to the British with little resistance. Afterwards, Greene played a prominent role in conducting the retreat of the Continental Army across New Jersey. He commanded the right wing of Washington’s task force during the Battle of Trenton on 26 December 1776. He also participated in the Battle of Princeton on 3 January 1777. In March, Washington sent Greene to Congress as his emissary to convince them of the pressing needs of the Continental Army. At the Battle of Brandywine on 11 September 1777, Greene led his division four miles in under fifty minutes through broken country to set up a defensive line that allowed Major General John Sullivan’s division to retreat. Then, he closed his lines and held the British at bay until nightfall which gave the main force time to withdraw from the field. At the Battle of Germantown on 4 October 1777, he led the left wing of the army. On 2 March 1778, Washington appointed Greene the new Quartermaster General of the Continental Army. The Quartermaster Department was in shambles and he had to labor long hours just to keep the Army operating. His reaction to his new assignment is best summed up with the statement, "No body ever heard of a quarter Master in History." Washington still consulted him on matters of strategy and tactics, and he participated in all councils of war. The next battle that Greene took an active role in was the Battle of Monmouth on 28 June 1778. On 7 June 1780, he commanded the front line at the engagement of Connecticut Farms in New Jersey. Two weeks later, he led the force that repulsed the British at the Battle of Springfield (23 June 1780). Greene resigned as Quartermaster General on 26 July 1780 because he did not agree with Congress’s new policy of requisitioning supplies from the individual states. In late September of 1780, he presided over the military court that convicted Major John André, the British officer who was involved in Benedict Arnold's treason, of spying. A month later, Washington gave Greene command of West Point. After Major General Horatio Gates was defeated by the British Army at the Battle of Camden (16 August 1780), Washington appointed Greene the new Southern Commander. After their stunning victory at Camden, the British had undisputed control of the states of South Carolina and Georgia with a clear path into North Carolina and Virginia. The British commander, Lieutenant General Charles Earl Cornwallis established a chain of posts in order to secure his lines of communication and rally Loyalist support. Greene would have to fight Cornwallis in a region that was a logistical nightmare. His first priority as Southern Commander was to rehabilitate an army that was outnumbered, ill-equipped, and demoralized. Greene split his force in the face of a superior enemy by sending a flying army under the command of Brigadier General Daniel Morgan to threaten Cornwallis and bolster local militia support. By separating his army, he was maximizing the limited resources of the land, while keeping the separate units close enough to unite in order to fight. He would avoid a major engagement with the British and harass them until he had the advantage and could go on the offensive. He coordinated his efforts with local patriots such as Francis Marion, Andrew Pickens, Thomas Sumter, and Elijah Clarke in petite guerre (partisan operations) against the British. Cornwallis reacted by sending a force under the command of his subordinate, Lieutenant Colonel Banastre Tarleton, after Morgan in the hope of catching him between the two British forces. When Greene learned of Tarleton’s pursuit, he wrote to Morgan, "Col. Tarleton is said to be on his way to pay you a visit. I doubt not but he will have a decent reception and a proper dismission." The result was the Battle of Cowpens on 17 January 1781. Morgan soundly defeated Tarleton in the greatest patriot victory of the war in the South, rivaled only by the repulsion of the British forces at Charleston in 1776. Then, Morgan reunited with the main force and the flight to the Dan River began in earnest. When Greene learned that Cornwallis was in pursuit, he exclaimed, "Then he is ours!" The "Race to the Dan" exemplified the superior mobility of the American Army. In a month’s time, the Americans marched two hundred miles to North Carolina eluding the pursuing British in harsh weather. It also exemplified Greene’s superior use of local geography and contingency planning. Greene succeeded in escaping the British Army and forced them to overextend their supply lines in one move. Cornwallis returned southward to recruit additional Loyalist support and supplies, while Greene re-crossed the Dan River and trailed him. The two forces met head-on at the Battle of Guilford Courthouse on 15 March 1781. Cornwallis succeeded in driving Greene from the field, but he suffered severe casualties in a Pyrrhic victory. When the British Parliament learned of the battle, Charles James Fox exclaimed, "Another such victory would destroy the British Army." Weakened, Cornwallis withdrew to Wilmington, North Carolina and eventually on to Yorktown, Virginia, where he was defeated by a joint Franco-American force. Next, Greene led his army back into South Carolina and began the 'War of the Posts.' Forces under his command along with partisans simultaneously attacked various points in the exposed British line of forts. He led his main army in three more engagements, the Battle of Hobkirk’s Hill (25 April 1781), the Siege of Ninety-Six (22 May-19 June 1781), and the Battle of Eutaw Springs (8 September 1781), the bloodiest engagement of the entire war. Although he succeeded in completely destroying British authority in the southern states, he never achieved a single tactical victory. His lack of success in winning a battle is best summed up in his own words, "We fight, get beat, rise, and fight again." In only twenty months, Greene succeeded in capturing all of the British posts taking 3,500 prisoners and splitting the British Army in half, bottling them up in Charleston and Wilmington. He also played a vital role in the re-establishment of civil government in the South. A major factor in his success was an outstanding group of subordinates including: two Marylanders, Otho Holland Williams and John Eager Howard, two cavalrymen, William Washington (second cousin of George Washington) and Henry Lee (father of General Robert E. Lee), and his Polish engineer, Thaddeus Kosciuszko. After the war, Greene moved his family to his new estate, Mulberry Grove, just north of Savannah, Georgia. He attempted to settle down to the life of a Southern planter, while spurning attempts by prominent Georgians to involve him in local politics. He was forced to sell additional property awarded to him by the states of North and South Carolina in order to solve severe financial problems caused by the war. Tragically, he died at the age of forty-four on 19 June 1786 of a stroke, possibly caused by overexposure to the sun. His remains and those of his son, George Washington Greene, rest beneath a monument in Johnson Square in downtown Savannah. Eventually, Congress would pay off his debt and erect a monument to his memory in the nation's capital. It will never be known to what great heights he would have risen had he lived a longer life. A monument (under which his remains are interred) to Greene stands in Johnson Square in Savannah (1829). His statue, with that of Roger Williams, represents the state of Rhode Island in the National Hall of Statuary in the Capitol at Washington; in the same city there is a bronze equestrian statue of him by Henry Kirke Brown at the center of Stanton Park. A small statue of Greene by Lewis Iselin, Jr. is part of the Terrace of Heroes outside the Philadelphia Museum of Art. In 2000, a six-foot tall, bronze statue of Greene by sculptor Chas Fagan was unveiled in St. Clair Park, in Greensburg, Pennsylvania.